If you are aquarium hobbyist you might already know what planted aquarium is. Planted aquarium is usually a freshwater aquarium with aquatic plants rooted in the substrate and grown in the aquarium. A well established planted aquarium is a marvelous piece of home decor. Any freshwater aquarium can be converted into planted aquarium. As far as aquatic plants are concerned they fall into one of four common class types: algae, floating plants, submerged plants and emerged plants. Keeping aquarium does not need pro experience level but need to have some knowledge about plant types and their difficulty level. Some aquatic plants require high tech planted aquarium with canister filters, proper lighting, fertilizers and high CO2 requirements while other aquatic plants require low light, low fertilizers and low CO2 they thus fall into low difficulty level plants. The beauty of planted aquariums lies in the placement of plants types, rocks, wood and other decors which is also called Aquascaping. The foundation of beautiful planted aquarium also lies in the substrate. Some experts use some sort of powders of fertilizers or additives for cultivating useful bacteria and also for boasting plant growth. I however started with a nano aquarium of 10 gallon and used simple Amano ADA Aqua Soil Amazonia and it worked for me so far. Now a well organised substrate foundation is not must but it will help to grow difficult plants like baby tears or Hemianthus callitrichoides. These difficult to grow carpeting plants grows very fast with good substrate foundation and CO2 injection and fertilizers and following the Iwagumi Aquascaping method. 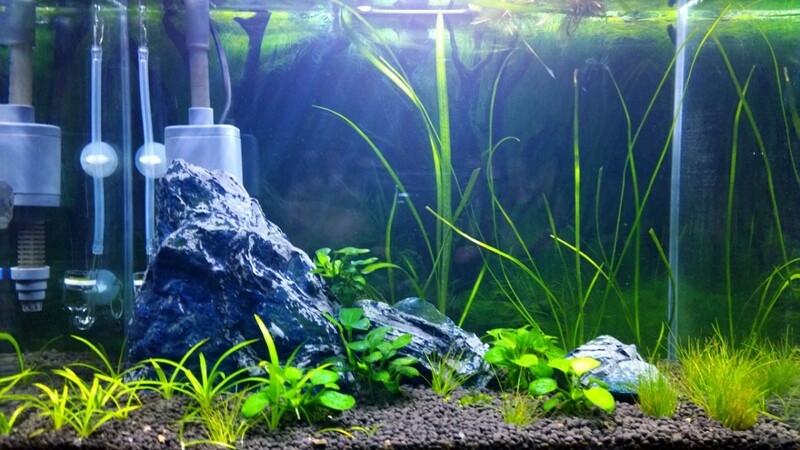 For many planted aquarium hobbyist they don’t care about foundation substrate or fertilizers much, they go straight growing aquatic plants they can still succeed with easy growing plants that don’t require the more light, CO2 and fertilizer. But if you get CO2 diffuser set for your planted aquarium you can still make more beautiful planted aquarium with both difficult and easy growing plants. I will tell more about the cheap CO2 diffuser more later. First I want to tell that a cheap CO2 diffuser which I am going to tell can change how your aquatic plants are growing right now. For my case I have seen a boost in my aquatic plants growth. Before using the CO2 diffuser there was very little leaf growth was there. Sometime yellow leaves were also seen. From my experience it proves that CO2 diffuser can change your planted aquarium into health planted aquarium even if you missed on creating a good fertilized and efficient substrate foundation or doesn’t add liquid nutrients for plants . Now since we came to conclusion that CO2 diffuser is required for healthy and beautiful planted aquarium which CO2 diffuser you must use. If you have good amount money you can buy expensive CO2 diffuser set for your planted aquarium. You can check here if you want to. If you don’t want to spend too much money on expensive CO2 diffuser set then I suggest a cheap CO2 diffuser set. I have made a video about DIY cheap CO2 diffuser. It works on principle of chemical reaction of baking soda and citric acid, when these two react they creates CO2 which can be channelized properly to diffuse CO2 into the planted aquarium. This cheap DIY CO2 diffuser can be reloaded with baking soda and citric acid and CO2 bubbles can also be adjusted as per width of your planted aquarium. To learn more check the following video and to buy the products for Cheap DIY CO2 set up check the products below.